Protesters urging educational legislation for immigrants rally outside top presidential political adviser Karl Rove's house in Washington. Stay with CNN for updates and analysis on the controversy over Condoleezza Rice's position on 9/11 testimony, and for news from the Bush-Cheney and John Kerry forces on the campaign trail. WASHINGTON (CNN) -- Hundreds rallied Sunday outside the home of Karl Rove, President Bush's chief political adviser, urging legislation that would allow undocumented immigrants who graduate from high school to legalize their status and qualify for in-state college tuition. Protesters stood outside Rove's Washington house to show their support for the Development, Relief and Education for Alien Minors Act, or the DREAM Act. The National People's Action, a coalition of community advocacy groups, led the protest. 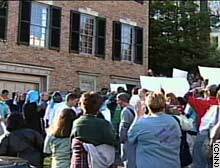 The self-described "community improvement" group often organizes demonstrations at the homes of government officials. "If President Bush wants our [re-election] vote, he has to give us the dream," said Emira Palacios, the group's co-chair. The measure would grant conditional legal status to youths who have lived in the United States for at least five years and were younger than 16 at the time of their entry. Their families must have paid taxes for at least three years. From 50,000 to 65,000 undocumented students graduate from high school each year, according to the National People's Action. "We paid our way to come to Washington, D.C., to talk to Rove, and he wouldn't listen," said Tomasa Fonseca, an educator from Marshalltown, Iowa. "So we came to his house to ask him to support the dreams of our youth." Palacios said Rove agreed to meet with group leaders in his garage but then chastised them for protesting in front of his house and scaring his children. "I told him that we have 65,000 students every year, graduating and crying because they cannot accomplish their dreams," Fonseca said. "I'm sorry that we disturbed his children, but our children are being disturbed every day." CNN attempted to talk to Rove outside his house, but police said he did not want to talk to the media.